Big Dodge Viper Fan? Have $295,000 burning a hole in your pocket? 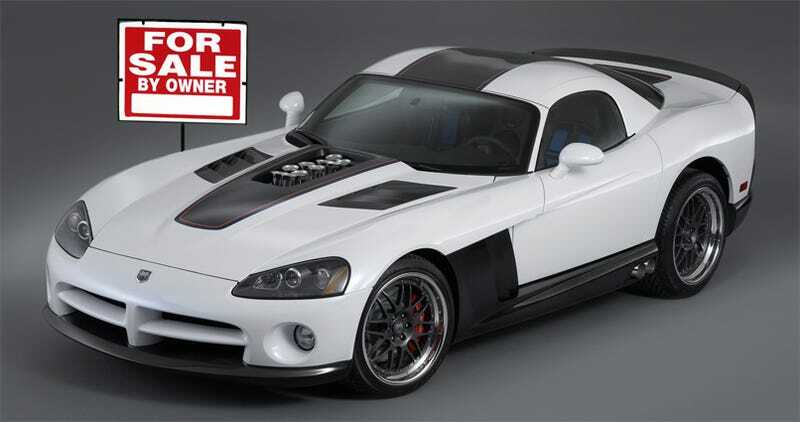 Always wanted to own one of the fastest, rarest Vipers ever made? Well we've got the car for you. The ASC built McLaren Diamondback Viper is now up for grabs on DodgeVipersForSale.com. Originally built for the 2006 Detroit Auto Show, the Diamondback Viper was a one-off concept based on the 2006 Dodge Viper SRT-10 Coupe that showcased lighter weight components and a McLaren tuned 8.0-liter V10 good for 615 horsepower. It was originally rumored that the Diamondback was the precursor to the 2008 model, but unfortunately it was shelved to live its life as a concept study only. The Diamondback Viper featured custom carbon fiber body panels, a special stainless steel quad outlet exhaust, a custom carbon fiber racing stripe with "Mclaren Orange" and "Viper Blue" accents as well as a custom in-hood trumpeted air intake system with individual port throttles. It's estimated that it cost ASC and Dodge $750,000 to build the one-off Diamondback Viper, but it can be yours for the much lower price of $295,000. This may seem expensive to you and me, but considering the collectability of concept cars, this is one's a steal. ASC (American Specialty Cars) has a long history of developing vehicle prototypes with innovations designed to showcase the company’s expertise in vehicle design and performance materials. ASC showed its expertise at the 2006 North American International Auto Show by unveiling a supercar made even more super by the addition of a mostly carbon-fiber body. A ‘snake’ with an all-new skin, the ASC Viper Diamondback is super-light and super-fast. It’s fitting that ASC, which helped the Chrysler Group bring the new Dodge Viper SRT10 coupe to life, would, with the aid of McLaren Performance Technologies, show how the Viper coupe might be taken to an all-new level of ‘extreme’. The 2006 615-horsepower Diamandback Viper features a carbon fiber roof, deck lid, rockers, fascia inserts and body trim. It also sports a massive OmniCarbon™ hood that shows off ten unique trumpeted air intakes, with individual port throttles peeking through. This is a McLaren Performance Technologies feature, reminiscent of McLaren Can-Am engines of the past. The hood is comprised of compression-molded carbon fiber, both painted and woven. It’s displayed beautifully, with a broad, clearcoated racing stripe down the Arctic White painted expanse, subtly outlined by “Viper Blue” and “McLaren Orange” pinstripes. In all, ASC removed about 85 lbs. from the vehicle — the hood alone weighs about half of the standard production model. Taken together with the performance modifications by McLaren, the resulting power-to-weight ratio is estimated to yield an incredible 0-60 time — in just 3.5 seconds!